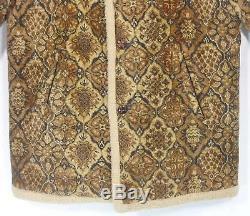 Rare vintage early 1970s Lakeland tapestry carpet sherpa-lined men's coat. Tagged size 42 long and measures slightly longer in the torso and sleeves than regular. 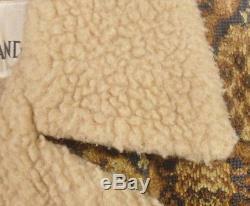 Made of brown, tan and black nubby textured chenille tapestry material that resembles a Persian carpet. 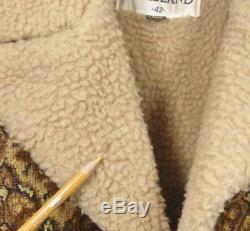 Wool-blend tan sherpa lining at collar, torso and trim along front opening and hem. 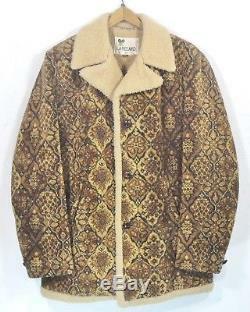 Hip-length car coat styling with braided leather 3-button closure and notched collar featuring a hidden chin strap under collar to fasten at the neck. Single accent buttons at cuffs. 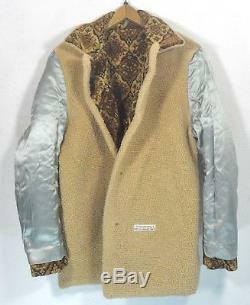 Insulated quilted satin lining through the sleeves. Tapestry material feels like cotton or a cotton-blend. 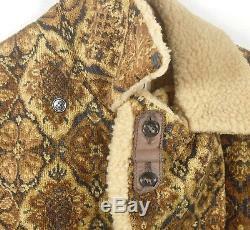 Excellent vintage condition with general signs of use and light wear on sherpa collar. Leather buttons show some loss of finish. See full item description and photos for complete details and measurements. See all photos for item details. Check measurements for proper sizing. Sleeve - 26 shoulder to end. Length - 32 shoulder to hem. 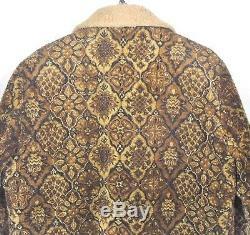 To see my other vintage clothing listings. Our merchandise is used, unless otherwise stated. As with most pre-owned items, some minor wear and signs of age should be expected. All major flaws and damage will be noted. Please check description and pictures carefully and message us with any questions. Sizes are estimates and can vary between brands, styles, eras and due to previous wear or use. 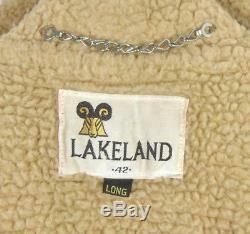 The size on the tag may not indicate true fit or correspond to current standards. Our garment measurements are taken seam to seam with item placed flat and will need to be doubled for chest, waist and hip size. Refer to the measurements provided and compare to a similar item you own to determine proper fit. First Class and Priority Flat Rate Envelopes do not offer tracking to most countries. THANK YOU FOR SHOPPING WITH US. Check out my other listings. 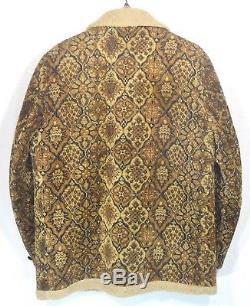 The item "Vtg 70S LAKELAND NUBBY TAPESTRY CARPET SHERPA LINED CAR COAT JACKET MENS 42 LONG" is in sale since Sunday, December 23, 2018. 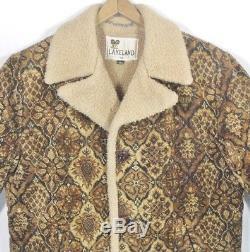 This item is in the category "Clothing, Shoes & Accessories\Vintage\Men's Vintage Clothing\Outerwear Coats & Jackets". The seller is "crazy*banana" and is located in Tucson, Arizona.